For the March 2 edition www.rockawave.com which I submitted yesterday morning. I am working on a PEP posting - the meeting went till 2:30 AM - I ran out of batteries at 1:30 and left before 2. Rockaway schools saved for now. That will take some analysis. Tonight hundreds of people will be at the Panel for Educational Policy (PEP) meeting at Murry Bergtraum HS in Manhattan protesting the closing of thirteen schools, including Rockaway’s MS 53 and PS/MS 42. There will be a rally and press conference by the Alliance for Quality Education (AQE) and MORE-CASCADE (the group I work with politically) at 5:30. 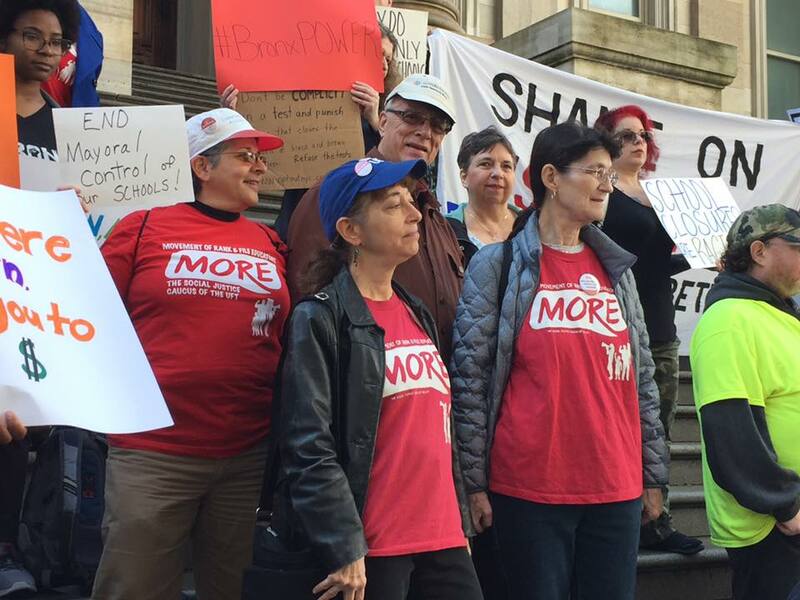 I’m heading over to the PS 42 hearing and NAACP press conference later today – look for coverage in this week’s paper, which last week featured a front page piece by Ralph Mancini on the MS 53 hearing: “Teachers say they aren’t buying rationale to close MS 53.” Hell, yes, no one should buy what they are selling when they close schools, for, behind it all is the goal of dumping often higher cost teachers and low-performing students and forcing parents to send their kids further away to school in the future. Behind many school closings is gentrification – the attempt to remake a local school to be more attractive to wealthier people moving into poor neighborhoods. 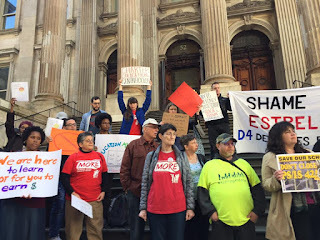 Last night [Monday Feb. 12] I went up to East 101St just off the FDR Drive and overlooking the East River to tape the PS 50 hearing and also to speak up for them as a member of MORE-CASCADE --- Coalition Against School Closings, Colocations, and Displacement Everywhere –it’s a mouthful. We intend to attend the February 28 Panel for Educational Policy vote on 14 school closings at Murry Bergtraum HS in as much force as we can muster to try to get all the schools to stand up together and say NO. If I swapped videos from PS 42 and PS 50 (District 4, East Harlem) you might not be able to tell the difference between the schools which are so far from each other geographically, but so close in terms of experience of the staff, poverty of the children, but also facing encroaching gentrification. Current and former students spoke passionately about losing their school. Teachers exposed the faux help they received, often consisting of outside consultants pushing useless professional development (PD) (how many years of experience do you need before they stop hocking you with PD up the kazoo?) instead of infusing real resources like more teachers to reduce class size and guidance counselors and social workers to address the learning issues connected to the socio-economic gap poor kids face that hinders their progress. And the point has been made in both PS 42 and PS 50 – why are test scores the end-all and be-all while not counting progress made in closing that social gap which is a pre-cursor to breaking the learning log-jam? I will put links to a variety of videos from both the PS 50, PS 42 and the Feb. 28 PEP hearings online for those interested in seeing some of these dramas played out. Those of us who have been involved in closing school stories for the past decade have seen a repeated pattern. School buildings are often coveted by charters. 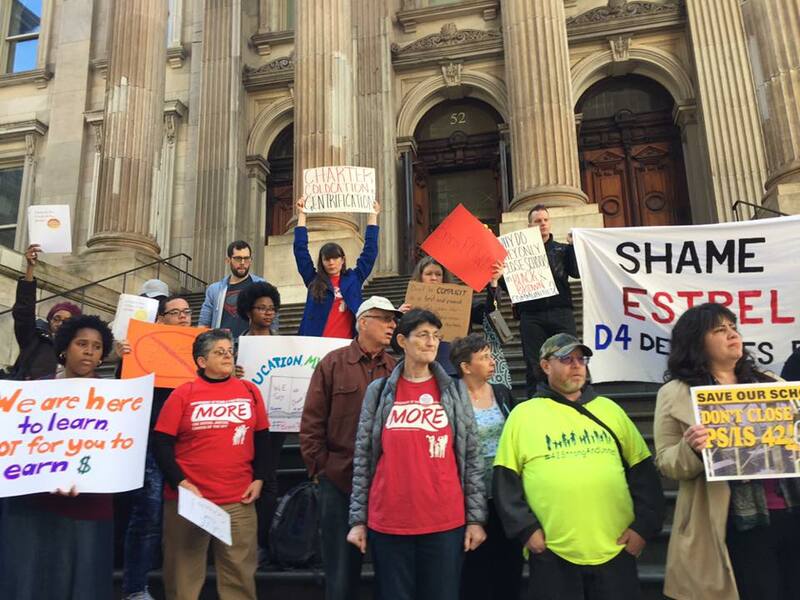 MS 53 is occupied by Eva Moskowitz’ Success Charter. A charter is going into PS 50, along with Central Park East 2, an elite k-8 school that is being moved from two current buildings it occupies. PS 50 was targeted for disruption by the DOE – the attack included not allowing new parents to register their kids so as to dump population and then claim no one wanted to go to the school, as insidious and dirty tactic one can imagine. A side story is that the principal of CPE2, an elite much coveted school with a large waiting list – so they won’t accept the current kids at the school, sided with the District 4 Superintendent Alexandra Estrella in a major political dispute and is being rewarded for her loyalty by getting the building. Also, across the street from PS 50 is a massive building housing another Moskowitz school. And I also noticed scaffolding going up around PS 50 to make massive improvements for the wealthier future occupants. Teachers complained that money that should have gone to help the kids instead went to cosmetics like expensive paint jobs. Note that PS 42 not too long ago had a beautiful extension attached to the old school. Why waste improvements on poor kids? While the attendance numbers at PS 50 are significantly better t(88%) han at PS 42, their numbers are worse. Yet in the first year they tripled their reading outcome from 5% to 16% but the next year fell back to 12%. 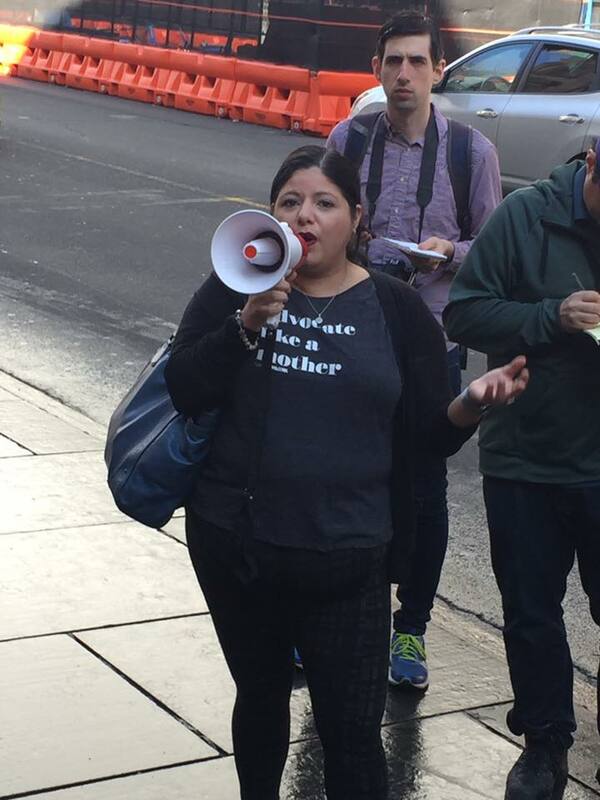 The major difference I heard at PS 50 was that the principal installed when the school became a renewal school, Esther Quinones, was a vicious terminator of teachers, attacked parents, openly lied to people, etc. – the often usual tactic used to rid the school of high priced teachers (younger, non-tenured are easy to remove – discontinue them). Imagine, in the midst of renewal and good outcomes the first year, the principal turned her guns on the staff, most likely on the orders of Superintendent Estrella, a known practitioner of that practice. At the hearing I read letters from teachers and parents talking about these policies. So the closing of PS 50 aside from all the other aspects, has this added wrinkle. Read more Norm, if you can stand it, at ednotesonline.com. In a natural language computer class I took at the CUNY grad center in the summer of 1988, the project I chose was to create a program to emulate a love advice columnist. I called it "Dear Blabby," using the famous Eliza therapist program, written in the mid-60s, as a model. 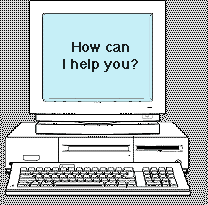 The most famous script, DOCTOR, simulated a Rogerian psychotherapist and used rules, dictated in the script, to respond with non-directional questions to user inputs. As such, ELIZA was one of the first chatterbots, but was also regarded as one of the first programs capable of passing the Turing Test. [There is some question about this claim]. ELIZA's creator, Joseph Weizenbaum regarded the program as a method to show the superficiality of communication between man and machine, but was surprised by the number of individuals who attributed human-like feelings to the computer program, including Weizenbaum’s secretary. the human, the machine is said to have passed the test.... While ELIZA was capable of engaging in discourse, ELIZA could not converse with true understanding. However, many early users were convinced of ELIZA’s intelligence and understanding, despite Weizenbaum’s insistence to the contrary. If you want to know how Eliza did that I'll have to charge you-- though now I could code my way out of a paper bag -- I might have to check with Jeff Kaufman. Every time I see a story about artificial intelligence I want to write a piece on my own experiences with AI 30 years ago when I was going for my MA in computer science at Brooklyn College and CUNY. Many of the courses I chose were AI, which was looking like gold in the mid-late 80s before crashing in the late 90s. There were many sub-fields in AI in the 80s - natural language, artificial vision, machine learning, expert systems and more. My final courses were pattern recognition (the basis of artificial vision) and one of the earliest classes in neural networks, which is the hottest thing going (I kept my textbooks but lost them in Super Sandy 5 years ago. If only I didn't go back to teaching in 1987 and stuck with it I may have been a contender. which talks about chatbots - the hot rage on all your help lines. These systems do not simply repeat what is said to them or respond with canned answers. They teach themselves to carry on a conversation by carefully analyzing reams of real human dialogue. At Microsoft, for instance, a new system learns to chat by analyzing thousands of online discussions pulled from services like Twitter and Reddit. When you send this bot a message, it chooses a response after generating dozens of possibilities and ranking each according to how well it mirrors those human conversations. The Turing test, developed by Alan Turing in 1950, is a test of a machine's ability to exhibit intelligent behavior equivalent to, or indistinguishable from, that of a human. Turing proposed that a human evaluator would judge natural language conversations between a human and a machine designed to generate human-like responses. Let me know when you can't tell the computer from a human (Where are you Hal?). It may not be long in coming. And then there are the robots coming which will replace us all as we head for Mars with Elon -- but that one another time. 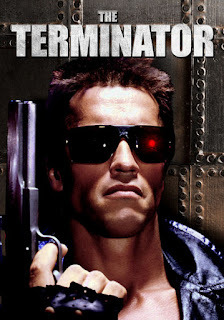 And how about Arnold and his pals in the first Terminator movie where the aim is to wipe out the human race. Thank you very much. I think there's a good chance we won't need robots to do that. I see some of my colleagues salivating over the state teacher strike in West Virginia. Don't hold you breath here in NY. Maybe when the conditions of teachers are back to what they were in the 1950s when desperation drove teachers to unionize and be willing to break the law (it was outlawed when they first struck) - I was a high school senior - and not long after I was a teacher 5 years later striking on my first days on the job, followed by 3 strikes the next year and another 7 years later. It's not just the Taylor Law, which also guarantees our old contracts stay in place until a new one is negotiated -- and dues checkoff is another bribe to unions not to strike. It's what people have to lose. Top salary will soon be reaching $118,000. That's like walking around with a target on your back and with so many leaving this current generation may mostly not make it that far. Here are 2 articles on the strike - Diane Ravitch and background from Mike Antonucci on the right who actually feels teacher strikes should not be outlawed - the libertarian view -- and he gives us some good background on the relationships between the 3 unions involved. It is posted at the horrible 74. I always find Mike's takes from the right interesting as they touch on my own libertarian tendencies. That the NEA and AFT affiliates have been fighting is interesting news, as is the story of the disaffiliation -- usually the AFT goes after the disaffiliated with guns blazing. Three unions representing public school employees in West Virginia announced a two-day walkout this Thursday and Friday to protest low pay and health insurance benefits. Solidarity among the three is significant, given that they have been at one another’s throats for years. AFT West Virginia and the West Virginia Education Association continued to battle for members and influence long after National Education Association and American Federation of Teachers affiliates in other states called a cease-fire. And the independent West Virginia School Service Personnel Association once belonged to AFT but disaffiliated in 2015. The unions stated that an “overwhelming” majority of school employees across the state authorized the job action, though it failed to release numbers on votes or turnout. There are several issues and complications for all involved. West Virginia teachers went out on strike across the state, closing down every public school. “Teachers across West Virginia walked off the job Thursday amid a dispute over pay and benefits, causing more than 277,000 public school students to miss classes even as educators swarmed the state Capitol in Charleston to protest. “All 55 counties in the state closed schools during Thursday’s work stoppage, Alyssa Keedy, a spokeswoman for the state’s Department of Education, said. “Data from the National Education Association show that in 2016, West Virginia ranked 48th in average teacher salaries. Only Mississippi, Oklahoma and South Dakota sat below it in the rankings, which included 50 states and the District. I wrote this column for the Feb. 16 edition of The WAVE but it didn't make it in. I expect it to be in the Feb. 23 edition. 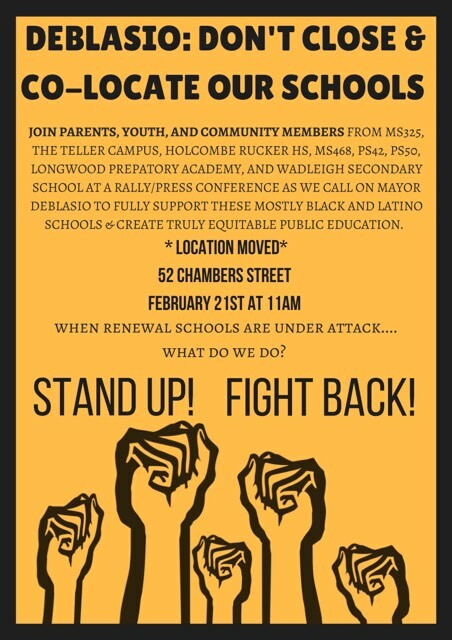 Also note that there will be a rally against closing schools today at 11 AM at Tweed. Unfortunately I'm stuck at home waiting for a delivery so I can't make it. Last night I went up to East 101St just off the FDR Drive and overlooking the East River to tape the PS 50 hearing and also to speak up for them as a member of MORE-CASCADE --- Coalition Against School Closings, Colocations, and Displacement Everywhere –it’s a mouthful. We intend to attend the February 28 Panel for Educational Policy vote on 14 school closings at Murry Bergtraum HS in as much force as we can muster to try to get all the schools to stand up together and say NO. They create new schools, only they're for other people's children. -------Paraphrasing speech by PS 42 Chapter Leader John Krattinger, who has exerted extraordinary leadership since the school closing was announced. John was a teacher at Rockaway's MS 180 over a decade ago when it was closed and replaced by the exclusive Scholars Academy where PS 42 kids would get not get accepted. To many advocates, it is clear that our education system is fundamentally broken and requires a deep restructuring that paves the way for future students to achieve better educational outcomes. Despite these noble intentions, the upheaval of closing an existing school and replacing it with one or more new schools creates instability, uncertainty and a lack of steady resources for current students. In the movement to end educational inequity, we must seek solutions that support the success of all students, tomorrow and today. To accomplish this, we must shift our approach from relying on metrics and test scores as the exclusive measures of student success to a more holistic approach that accounts for the needs and experiences of each student. This means increased guidance counselors, college advisors, drug abuse counselors, and mental health resources. This requires a shift from harmful school policing practices and school suspensions to restorative justice and anti-bias initiatives. Although the Renewal School Program encompasses strategies for some of these goals, not all of them are given the investment our students deserve. An article posted by the Rockaway Youth Task Force soon after the Rockaway school closings were announced in December. Kit and Marian, who were founders of Teachers for a Just Contract (TJC) in 1992, a caucus that merged with ICE and others to form MORE in 2012. I posted this piece with some comments back in 2007 soon after Unity Caucus attacked ICE-TJC pres candidate Kit Wainer for being a socialist. They wrote this 21 years ago when Shanker died. Sean Ahern posted the article on the MORE listserve. While I don't sign on to the entire analysis, most of it is pertinent, especially the UFT recent waffling on support for the MORE reso on Black Lives Matter and the argument that the Shanker led UFT made the right decision to not condemn the Vietnam war. I was a 2nd year teacher in 1968 and did not cross the picket line, though I was unaware of the deeper issues. I also was on strike in 1967 and 1975, when I was very active in the opposition to Shanker and opposed the settlement of that strike that led to the layoffs of 15,000 teachers. Both issues, the UFT and race and the war are touched on in this essay, as are the connections of Shanker to ed deform in its earliest manifestation in the early 80s. Don't forget - Shanker created the concept of charter schools. Check out the review Vera Pavone and I wrote for New Politics of the Shanker bio: Albert Shanker: Ruthless Neo-Con where we showed the roots of union support for ed deform were sowed by Shanker and Randi was just following in his footsteps. Sean was critical of our take: Sean Ahern: Shanker as NeoCon? THE DEATH OF Albert Shanker on February 22, 1997 provoked a flurry of eulogistic praise both inside and outside the American Federation of Teachers (AFT). Presidents, think tank experts and AFL-CIO leaders held in high regard the man who had presided over the national teachers’ union for twenty-three years. Although the AFT is less than half the size of its rival, the National Education Association, Shanker had become the most widely known figure in teacher unionism.